Getting insight from pixels is the core idea behind Computer Vision technologies. Computer vision is an interdisciplinary scientific field that is concerned with teaching computers how to make sense of digital imagery. Computer Vision techniques have shown a lot of promise in multiple fields like healthcare, autonomous driving, retail, Face detection and even manufacturing and the use cases increase day by day with advancements in technology. One such application is in the field of Satellite imagery domain. Oil is an area which concerns many nations and has been at the centre of the storm for quite a long time. Oil is stored in barrels and it isn’t easy to monitor the oil since nobody has a clear idea about the amount of oil sitting in all the containers, on the planet. 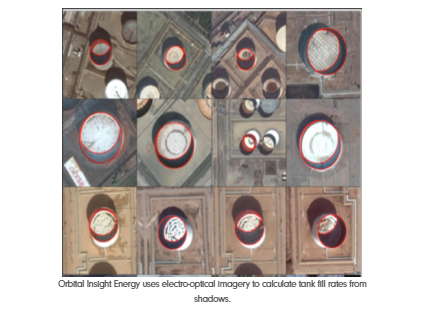 Orbital Insight, a Geospatial company, analyses vast amounts of photos of oil tanks with floating lids using Computer vision and Deep learning techniques. Crude oil is stored in cylindrical containers that have floating lids. When the level of oil goes down in these tanks, the lid also sinks and when the oil is refilled the lid rises. These containers are huge and hence can be easily seen in photographs taken from satellites. Along with the lids, the shadows cast by the sun on the inside of the tank also changes during the different time of the day. By detecting patterns in how those shadows change, analysts can estimate how much oil is available in all the tanks it monitors. Orbital Insight hopes to discover information that affects the global economy, like oil surpluses or shortages. It is employing AI techniques to work on some real problems threatening the planet.